Your first goal upon leaving the Wind Shrine should probably be heading to Tule. Located to the southwest of the Wind Shrine, not far from the Pirate Hideout where you gained your ship, it’s a small town with a variety of items to find and things to do. This is a good place to grind if you want to build up some basic Abilities in preparation for coming areas, as well. If you want to maximize your experience, fight on the thin stretch of land to the east of Tule - the monsters here are stronger than average, but still manageable at your level. 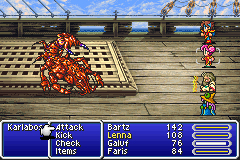 Though you can create any team you like, if you’re a newcomer to Final Fantasy V it’s wise to balance yourself with different characters in different roles. Two characters as fighters (Knight or Monk), one as a glass cannon (Black Mage) and one as healer (White Mage) will provide a nice, sturdy team. - Faris will leave your party temporarily whenever you enter Tule. This may seem annoying, but he’ll show up whenever you enter a shop, so equipping him is no problem. You can purchase weapons, armour, and spells in Tule; if you have a Black Mage (recommended) you should, at the very least, invest in Thunder, though it’s wiser to just buy every spell you can afford. - Have a look around outside. There’s a barrel beside the Inn in the east that contains 150 gil, and in the north you’ll find a Tent and a Potion by checking the cluster of barrels and crates. In the far north, to the right of the northernmost house, you can find Leather Shoes in a crate beside a small water mill, and if you pass through the trees to the left of the house you’ll find a Phoenix Down. - Pop into the buildings. In the east-most building - the ‘Greenhorn Club’ - you can find a Phoenix Down, a Tent, and a Potion in the jar, crate, and barrel; an Ether and 100 gil in the two chests (reach the second chest by passing through the left wall); and Leather Shoes in the chest on the second floor. (As well as a Goblin. Meh.) There are no items in the other buildings, but you can watch a cut scene with Faris in the Pub, and you can play the piano in the Pub once you get the dancers out of the way. Playing every piano you find actually serves a purpose much later in the game. - Head to the far north house. This belongs to Zok. After a series of cut scenes you’ll gain the Canal Key, which will allow you to leave the small bay of this area. Before heading out of this area, dock your ship to the south of Tule and walk north to the Cave where you more or less started your journey. The Pirates’ Hideout is now a little more open than before, and you can find Boko resting in one of the rear rooms. You’ll find him here again much later in the game. To the left of the entrance is a switch; hit it, then enter the northwestern room. Inside you’ll find an opened path containing a Tent, an Ether, and 300 gil. One of the pirates near the entrance will also give you eight Potions if you speak to him. Sail east of Tule. You’ll see a thin waterway through the mountains leading further east. Approach and you’ll find the Torna Canal, an area populated by watery foes. None of them are terribly powerful. At the end of this short eastbound trip you’ll hit a cut scene, and beyond that a boss. This battle is moderately tricky, mainly because Karlabos likes to paralyze your characters. It can also reduce your enemies to single digits. You can very quickly get around this by changing all four of your characters into Black Mages. If each of them uses Thunder on Karlabos in the first round, it’s entirely likely that you can kill the fiend in a single turn. Otherwise, smack it around with normal attacks, using Thunder whenever you get the chance. You’ll get a Tent for killing Karlabos. A semi-haunting cut scene follows, and once it’s done you’ll wind up in a new area that you must bypass before you can return to dry land.